I am working on a sample dash board and I am using a Vertical Bullet Chart. I have defined 3 colour ranges, actual and target values. colour range. Is this possible in Fusion Charts? I have attached a sample image of what I am expecting. 1. How to add this custom text as the tick mark text? 2. Also Can we change the tool tip text of the actual value (by default the tool tip contains the value itself)? 3. "plotasdot" is making the Actual value as a 'Dot' - Similar to this, is there any way to plot it as a line? 4. 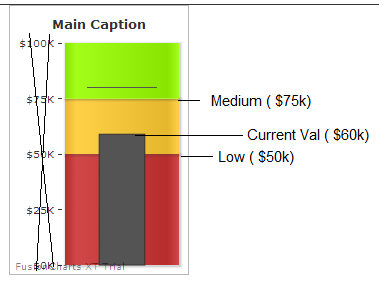 Can we change the colour of the Actual Value & Target Value? Can you please guide me on these? Oops, Please ignore 4th question. (I found the properties related to fillColor and targetColor). >>As of now this feature is not available. However, as a workaround you can use the Annotations to fulfill the needed scenario. >>As of now, In Vertical Bullet widget it is not possible to provide custom tooltext. >>You can only opt to show the plot as point or a bar. >> Yes, you can use the 'plotFillColor' and 'targetColor' attributes of the <chart> element to provide the color of the plot color and the target color. Thanks Rishab for the information. How ever while attaching the annotations, is there any way to find the 'Y' coordinates of the Color Ranges, Value dot as well as the Target Line? 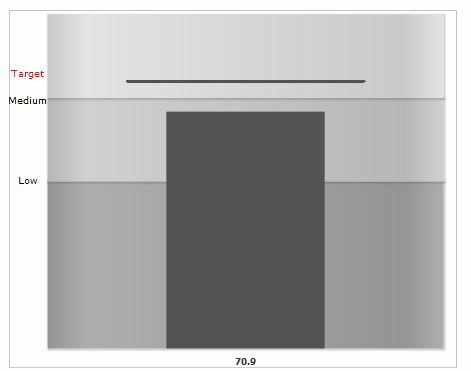 Since these charts are driven by Data base values, we can not fix the 'Y' coordinate of the Annotation during design time. If we can get the Y coordinates of where the color ranges are ending, we can add the annotations at those places in the JS code. Can you please guide me on this? As of now it is not possible way to fetch the 'Y' coordinate value for Annotation element. You will have to write your own logic to identify the Y co-ordinate based on values retrieved from database.